Liz Pinkston was introduced to barrel racing at an early age. Attending rodeos where her dad, Ralph Bradford, was a bull rider, Pinkston became hooked on the speed and excitement of the sport. “When I first saw it I said that’s it, I want to be a barrel racer,” Pinkston said. Her dad sold his bass boat to buy Pinkston her first competition horse, and the whole family became involved from there. Beginning with youth rodeos, then High School Rodeo and through college Pinkston traveled to compete on a series of horses, including Alvin, Jimmie and Wicked. While she enjoyed plenty of success as a youth, things really began to click when she met up with a horse called Speedy Doc Holiday –“Doc”. While on the road in Oklahoma City in 1999, Pinkston heard of two likely prospects for sale and started riding and working with both of them to see if either had what it would take to make a National Finals Rodeo (NFR) mount. Doc was one of the horses Pinkston tried out. He impressed her with sweltering times at a local jackpot event. She tested her new mount further by entering events featuring some of the sport’s greatest names and found Doc equal to the task. In 2004 the pair fulfilled Pinkston’s dream, qualifying for the 2004 Wrangler NFR. Pinkston was concerned going into the 2004 Wrangler NFR competition with Doc. The horse had trouble traveling. 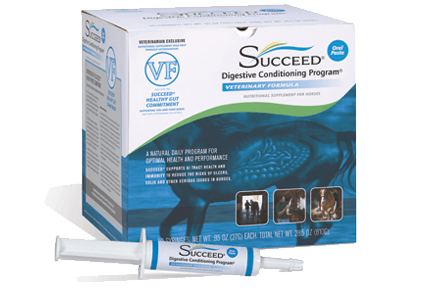 Looking for a way to keep Doc at his best throughout the prestigious event, Pinkston turned to her veterinarian, Madalyn Ward, DVM, who suggested she try SUCCEED® Digestive Conditioning Program®. Pinkston and Speedy Doc Holiday finished the 2004 Wrangler NFR in 6th place, winning round 9 with a time of 13.81 seconds and Pinkston became a firm SUCCEED® believer. Great health starts from the inside, out, as Pinkston discovered with Speedy Doc Holiday. The rigors of tough competition, including training, traveling, stalling and intermittent high- grain feeds, can cause problems for the equine digestive tract—which is the fuel line for the horse. 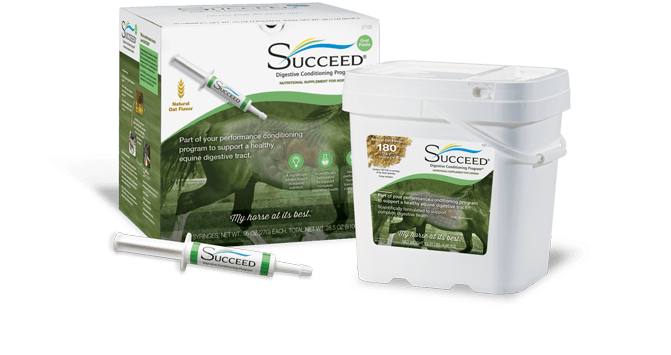 SUCCEED® Digestive Conditioning Program® helps to support that fuel line so that critical nutrients can be absorbed, helping horses perform to their potentials.